California Wine Czar Bill Clinton today announced his own version of the recently enacted Economic Stimulus Plan. "I think it is great," said the former president and now Wine Czar for the state of California, ".. that citizens and non-citizens alike are getting up to $600 to put back into revitalizing our slumping economy. I would like to do something similar for California." A reporter asked Clinton if this inferred that wine sales are slumping in the state. "Oh, not at all," replied Clinton. "Wine sales are doing fine. But votes for Hillary seem to have taken a downward turn and that's not good. That is why I have introduced my Vote Stimulus Package. It's time to reverse this slump and put the right person into the White House." A spokesperson for the Wine Czar outlined the plan, which is quite simple. Buy any California wine that has a picture of Hillary Clinton on it. Soak off the label and send it with a sworn affidavit that you will vote for her when she runs against John McCain after storming her way through the Democratic National Convention and seizes the nomination. A wine stimulus check in the amount of $50 will be sent to the person submitting these items. Clinton was asked what happens in the event Obama wins the nomination instead of Hillary, and also asked if they were really going to rely on someone's word about who they voted for, when there is no way to verify that. "Look, consider this the same as a rebate check," answered Clinton. "Does anyone really get back rebate checks? Notice on the Hillary label it says to allow 8-10 months for the stimulus check to appear. Now that could actually mean from the time Hillary is elected, or sworn in, or for her 2nd term, or whenever. We'll deal with actually having to cough up the money when the time comes. You seem to forget I was known as the 'Teflon President.'" Well as you can probably tell from the above that I was dry on ideas today. Anyway, I did get my $600 check the other day and did I go spend it on something wine-related? Nope! 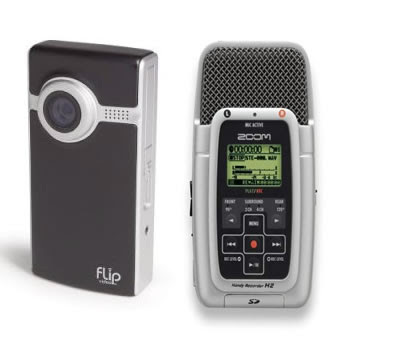 Instead I got a couple of toys from Amazon.com (see above picture): A Flip Video Ultra Camcorder and a Zoom H2 Digital Recorder . I guess these could become wine-related, such as using the camcorder to do video reviews a la Gary Vaynerchuk, or use the digital recorder for tasting notes. But probably not.. they're just both a lot of fun to play around with! So that's today's semi-wine-related blog post.